« She was so happy that she almost felt frightened. You have to stay in a place through all the seasons to appreciate everything that it is. I have never been to Texas, so pretty much everything I know about it comes from watching Friday Night Lights. In short: it seems like a nice place with some pretty cute boys. Does that about cover it? There are a lot of jokes about how seriously people from Texas take being from Texas, but I have to admit to you that I am pretty serious about being from North Carolina. You can ask some of my friends who moved away whether I still give them a hard time about abandoning our fair state, and they will tell you that the answer is yes. (Susan? Can I get an amen?) I got this from my mom, who was also raised in this land of tobacco, red clay, and college basketball. Most of what my brother and I did as children centered around our extended family, and what I learned from them was to love God and love the land and people around us. There was something beautiful about every season: the fireworks of leaves in the fall, the mild winters and wonder of occasional snow days, the daffodils and dogwoods in springtime. But summer is when I really learned what it means to love North Carolina. Our hot summer days fade into muggy nights as the edge of the yard is dotted with fireflies. We drink sweet tea in mason jars and pick corn in grandma’s garden, shucking it on the back porch. We snap beans in front of the TV, lounge inside reading novels in front of the air conditioner, and beg to go to the pool. There is a chance of thunderstorms every day, but it hardly ever happens. And we eat tomatoes fresh from the garden, anyone’s garden, because everyone has extras. It is hard to narrow it down, but tomatoes might just be my favorite part of summer. I refuse to eat those ugly pale ones that are all you can get in the grocery store in the winter. 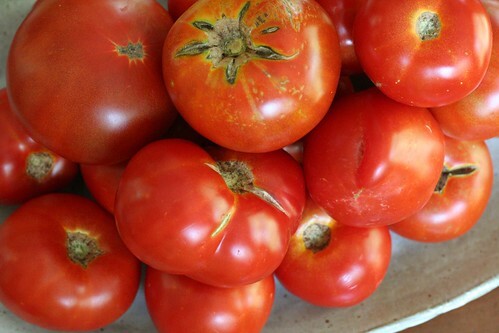 Tomatoes mean BLTs and canning and fat slices on hamburgers. They taste like heat and sunshine and afternoons at grandma’s house. When Tanya Davis opened the show we saw on PEI, her first song was focused on the beauty she sees and loves around the Island. The line I quoted in the title of this post stood out to me: You have to stay in a place through all the seasons to appreciate everything that it is. I think PEI is a wonderful place to visit, but she is right: I only know a part of it. On the way back to our B&B, I told Mike, “The way that she feels about PEI is how I feel about North Carolina.” Perhaps it was one reason I loved her songs so much: I recognize myself in those words, in that rootedness. I love all four seasons here, even the things that seem to drive other people crazy. It is where I am from and it is a part of me as much as my family. It took me a long time to realize that everyone doesn’t feel this way. On Prince Edward Island, I noticed that the tomatoes on our salads were, frankly, not very good. Possibly it is not quite tomato season there yet. Or maybe it doesn’t ever get hot enough for them to have a real tomato season, not like we do. It was disappointing. They had many other delicious foods, but I thought from time to time about all those tomatoes that I was missing back home, the juice running down your arm as you take a bite of your sandwich. I saw my mom on Saturday, and she brought me a bag of tomatoes from my grandma’s garden (and some from my great-uncle as well). I realized how glad I am to be home. Title quote from “Potatoes” by Tanya Davis. Click here to listen to it. Thanks to Claire, Kelly, and Sarah for inspiring me to think about home. mmmm – what a lovely post. I’ve always wondered what it would be like to know a place like this. the closest I got was Virginia… thanks for the link-up! This is such a feel good essay. Thank you for linking up and thank you for taking me home to my country of birth… South Africa. I am homesick tonight. lovely post – I’ve seldom lived in one place long enough to really become intimate with its moods. @Susan: You just say things like that to make me even more upset with you for leaving. I know your tricksy ways. One of my favorite posts from you, if not my absolute favorite. I love home, and this post reminded me of all I love about Florida (and it’s not palm trees and sandy beaches). I wasn’t born in North Carolina, but I think I feel a bit of this about it here. The thing about living “up north” (Mid-west, really) and then moving down south is that when I’m here, people called me a Yankee and when I’d go back there, they called me “y’all” (those northerners don’t know the rules about how to use y’all). So there is a sense of homelessness when you move around as a kid, especially if you cross that Mason-Dixon line. But I’ve been here now for 13 years and my kids are officially North Carolinians, as is my husband. So I think that counts for something. I’ve lived lots of places, and this is by far my most favorite. My parents lived in Texas for a while and my mom hated it because the trees were too short and the sidewalks were overgrown and the sky was too big. Translation: it was too far away from her kids and grandkids. I guess it’s hard to separate the place from the people, if that even makes sense. @emily: It makes sense to me, because I came very very close to putting a line in here about that. I couldn’t figure out exactly how to phrase it. But in a lot of ways, I think that to really know and love me, you have to care at least a little bit about North Carolina, because being from here is a big part of who I am. I am sitting here with tears in my eyes as I remember my Granny’s home and garden — all these memories are flooding in — because of your beatiful writing — Thanks Kari! Love my memories — I will eat a mater samwich with dukes may, on white bread for you! @kathy: Of course with Duke’s. It couldn’t be any other way. Actually, we do have tomatoes here on PEI. We get plenty of them from gardens, but not usually until August. In fact, we have our very own hothouse tomatoes grown hydoponically right here in Charlottetown at vanKampen’s greenhouses. They have them most of the year. And they are always delicious. I am glad to hear that you have good tomatoes and I’m sorry we missed some of the good ones when we were there! you knocked another one out of the park for me, friend. i’m so glad we both have such a love for our state, and to know it the way we do, makes my heart so happy. just last night, hubs and i were discussing NC. and while he (being from above that before mentioned line) may never truly feel as at home here as i do, i know it will always be home to us. I heard an interview with he author of “Ripe: One Man’s Quest for the Perfect Tomato” on Weekend Edition this morning and thought of this post. Here is the link in case you missed it. Hey Kari! I loved this post. I didn’t grow up here either and I’m so glad God led me here. I think life is like that too…you don’t appreciate the happy times without going through the sad ones. Send me an email if you get a chance. I’d like to get lunch with you someday and talk about GA.